I'm often showing 'nice' sketches on this blog. What I consider finished works. Things where I took a reasonable amount of time (45 minutes? an hour?). And things that often call for an easel and a watercolor kit. Today I wanted to show the opposite. Sketches that took 5 minutes or less. Drawn in a cheap 3x5" pocket book with flimsy paper. Sometimes when you're travelling, you're not in the mood for carrying your gear. Or you're with people, and you don't feel like asking everyone to wait for you. That's when I go into snapshot mode. Drawing standing with two pens (my current favorites: a Platinum Carbon pen, and a Kuretake Sumi brushpen). Often I don't even stop walking - getting the first few lines in, then doodling from memory while walking away. It doesn't take any longer than pausing to take a photo. And I enjoy the feeling of filling up these tiny sketchbooks. The drawings are so fast, you can easily fill a book in an afternoon. I enjoy these little booklets as keepsakes of the trip, and as small studies that I might paint from later. 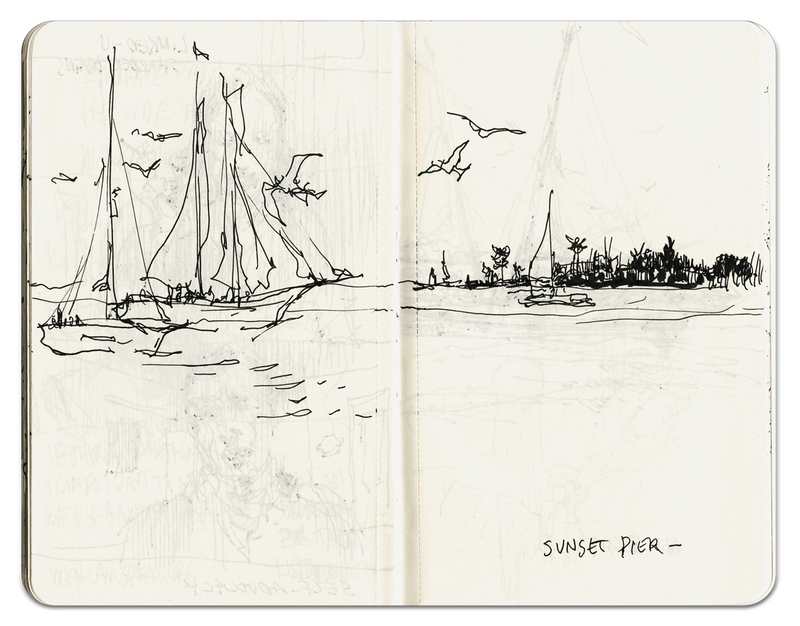 I might just take a detail – a boat I liked, or the shape of a palm tree, into a future studio painting. Mostly though, I just do them for the pure fun of it. Even if I never look back at them, every drawing builds your visual memory. Just like taking snapshots – probably they just go into your albums and lurk on your computer (or on my bookshelf) – but the act of taking them is a way of looking deeper at a place. It makes for lasting memories. And maybe when I’m old(er), those albums will come back out again. Who knows! You can see the ‘for real’ paintings from this trip to Florida over here, and some more over here.